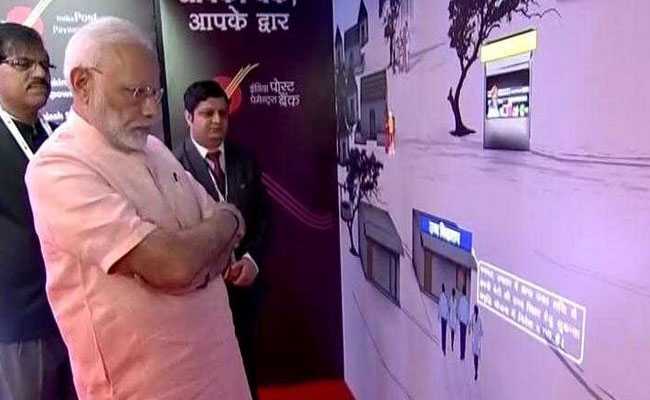 NEW DELHI: Prime Minister Narendra Modi today launched the India Post Payments Bank or IPPB -- the largest payments bank in the country by network size. A payments bank operates on a small scale; it carries out most banking operations but cannot give loans or issue credit cards directly. The new bank will leverage the postal department's vast network across India and help people in previously unbanked rural locations to use banking services easily, the Prime Minister said. He also used the occasion to launch a scathing attack on the Congress, saying it had fostered a "phone-a-loan" scam that resulted in the Indian banking sector's huge bad loan problem. "Just a few days after our government came to power, we realised that the Congress had left the nation's economy on a landmine," PM Modi said at the launch event in New Delhi. "Our government brought out the true picture of NPAs (Non-Performing Assests) and the scam of the previous government," he added. He also said that the IPPB's services will be made operational at 650 branches and more than 1.5 lakh post offices which will be called "access points" by December 31. The move is likely to take banking services to India's hinterlands, the IPPB said. 1,435 crore earlier this week, which will help the state-run entity compete with big private players like Airtel Payments Bank and Paytm Payments Bank. The products that IPPB will offer are: savings and current accounts, money transfer, direct benefit transfers, bill and utility payments, and enterprise and merchant payments, the new payments bank said in a statement. People can use IPPB's products and services via multiple channels such as counter services, ATMs, mobile banking app, SMS and IVR (interactive voice response). According to analysts, the India Post Payments Bank's strength is the fusion of its legacy workforce with modern technology. The department's three lakh postmen and other associates will reinforce digital services with physical delivery of services. The IPPB started operations in January last year with two experimental branches, one at Raipur in Chhattisgarh and the other at Ranchi in Jharkhand. 1 lakh can be accepted by payments banks. Though they can't give loans, they may offer third-party products. IPPB will work as an agent of Punjab National Bank. Seventeen crore postal savings bank (PSB) accounts will be linked with India Post Payments Bank accounts, giving an edge over private players who have had to spend a lot to acquire customers. "IPPB has been envisioned as an accessible, affordable and trusted bank for the common citizen, to help speedily achieve the financial inclusion objectives of the Union Government," the Prime Minister's Office tweeted this morning.